SESSION I: Tentative schedule information available here. See equivalency list below for IU course equivalencies. SESSION II: Tentative schedule information available here. See equivalency list below for IU course equivalencies. Course Equivalencies: Please see the Alcala-CIEE course equivalency list for program enrollment requirements and a list of IU course equivalencies that students have received in the past. *Note: IU selectively co-sponsors CIEE program offerings, including the one described on this page, but not all CIEE tracks/offerings. Please contact Overseas Study for clarification. See IU Fee Sheet or IU Fee Sheet 2 Sessions for additional cost and payment details. Special discounted CIEE fee for IU students. Based on published CIEE materials. Indiana University cannot guarantee the prices charged by CIEE and is not responsible for any price increase or change. Program qualifies for need-based CIEE Overseas Study Program Specific Scholarships. Applications should be submitted to Overseas Study at the time of program application. Airfare, personal expenses and vacation travel additional. Initial prepayment of $500 due March 8, 2019. CIEE scholarships and grants available. 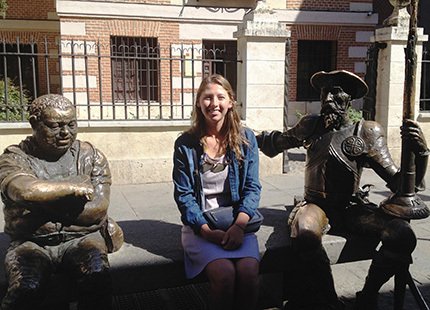 Read the IU Overseas Study "Getting Started" handbook for summer programs.